Another installation to the holiday kit reviews. 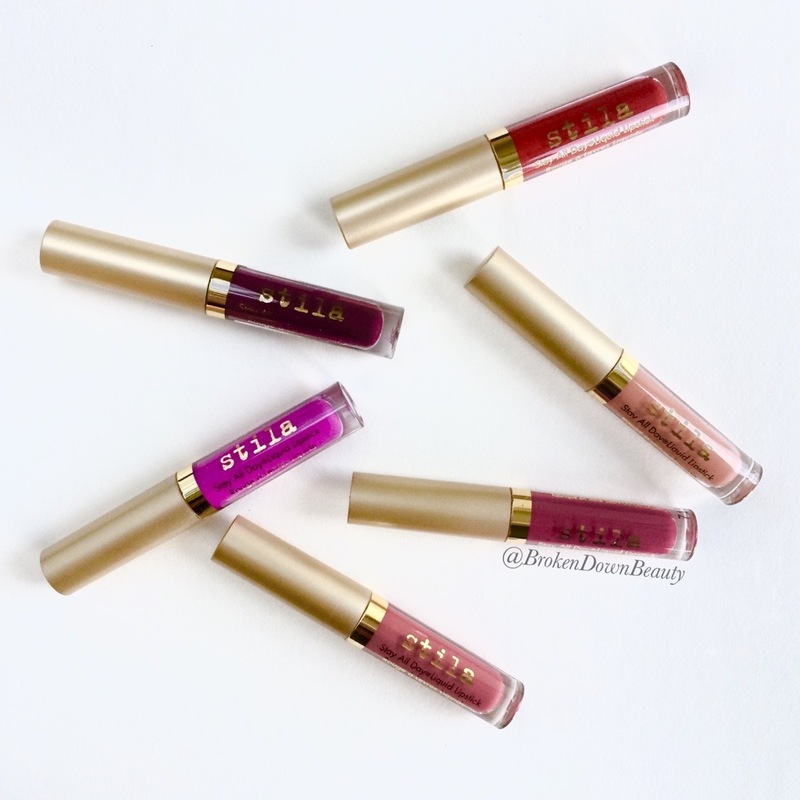 Stila’s Stay All Day® Liquid Lipstick has never been as wildly popular as other brands out ther (think Anastasia Beverly Hills or even NYX Cosmetics). So I thought I’d give this cute, little kit a try. I’ll put the emphasis on “little.” While this kit doesn’t necessarily offer any less product than others, they definitely didn’t glamour up the packaging. It’s about as small as a deck of playing cards. Hey, if they charge me less, because they don’t waste money on packaging I’m going to inevitably throw out anyway, more power to them. The Eternally yours Liquid Lipstick Set comes with six deluxe sizes of long-wear, matte, liquid lipsticks that come in four classic shades and two exclusive ones. While the colors are very saturated and go on nicely, drying to a lovely, matte finish, it doesn’t wear that well. It begins to feather off, starting at the center of the mouth. When you try to apply more lipstick to the now-bare parts of your lips, the formula begins to pill up and create chunks. Not so flattering. While I like it, this isn’t my favorite formula. As the for the two exclusive colors? Caramello is nice, but not exactly unique, and Chianti appears more black-ish and fairly harsh on lighter skin tones. It would look most flattering on dark, cool skin tones. Overall, the kit is nice, but not the best formula or colors (which vary from office-appropriate to special-occasions only (Coco, anyone?). So give this a thought before you buy. My favourites are the tame shades: Patina and Caramello. But I like the saturated shades all on you, especially Aria and Fiery. Too bad they don’t perform that well though! They are awesome colors, and thank you! Yeah, if they held up a bit better, I’d be wearing them way more frequently. It’s hard to find good, matte nudes that don’t make you look like a corpse!